Oral-B Pro Black 7000 review: best battery powered toothbrush | These products will change your life. The Oral-B Pro 7000 SmartSeries Black is unique among electric toothbrushes. Oral-B Pro 7000 with the ability to clean the teeth and the tongue of accumulated bacteria that are known to be the cause of oral malodor. It also has a few modes such as the deep cleaning mode (Deep Clean) and gum massage mode (Gum Massage). To switch between them, simply press the Mode button (“Mode”) until you see the mode you want. What’re People Say About The Oral-B Pro 7000? Is the Oral-B Pro 7000 for you? What’s Bad About the Oral-B 7000? In the Oral-B Pro 7000, as with all electric Oral-B toothbrushes, they implemented a technology vibrational-rotational movement. Small in size, round brush head pulsates at a rate of more than 40,000 times and ranges over 8800 times per minute and removes the plaque, bacteria and food particles from the mouth. In 2011, after nonprofit research, Cochrane showed that cleaning your teeth with an electrical toothbrush provide the efficient removal of dental plaque and reducing gingivitis. It also greatly simplifies the cleaning process due to the fact that you do not need to constantly move the brush head back and forth. A small brush head provides access to hard to reach places in the mouth, such as the back teeth, which is sometimes very difficult to brush. The toothbrush has a built-in two-minute timer and quadrant timer which provides a small pause every 30 seconds, so you can move the brush head in the right part of your mouth. This information is also displayed on the electronic display wireless SmartGuide. It’s what happens when German engineers have a zero tolerance for plaque. It accelerates to top speed faster than a high-performance sports car. Seven independent functions. Up to 800 brush movements per second. Designed by Braun, it truly is engineered to perform. Electronic SmartGuide wireless display, battery powered, provides a visual indication of how well you brush your teeth, so you do not have to rely on the sound signals of your toothbrush while brushing your teeth. The SmartGuide for each cleaned part of your mouth will give you a star, but after a time of two minutes the smiley face lights up on the display. SmartGuide is like having a dental professional in your bathroom, helping you learn to brush like a pro and providing while-you-brush feedback to help you brush thoroughly, gently, and for the dentist-recommended two minutes. Information about your selected cleaning mode is also displayed on the display. If a toothbrush is not used, the time on the display SmartGuide doubles. And if you want, you can attach the display as a wall clock using SmartGuide display holder and glue that are included with your toothbrush. Integrated pressure sensor prevents possible damage to tooth enamel or gums due to excessive toothbrush head pressure. If you are too hard pressed against the head of the toothbrush, the display lights up SmartGuide sad smiley. The main body of the brush can also light up the indicator is red, then head rotation rate slows down as long as you do not reduce the pressure on the mouth. The charging station is quite compact in size, therefore, ideal for the interior of a small bathroom. Charging station includes compartments for storing extra heads, which is very convenient if this brush, in addition, enjoys one of your family members. You can order kits with interchangeable heads over the Internet that specialize in the sale of electric toothbrushes Oral-B. For example, on Amazon. They come complete with blue bristles that fade after three months of continuous use, which indicates you at the time of replacement of the toothbrush head. The ability to choose the nozzle and the cleaning mode makes Oral-B Black 7000 truly universal toothbrush, which is suitable for the whole family. All you need to do is to change the toothbrush head. In addition, the heads of toothbrushes provided small rings of different colors, using which you can always determine which head belongs to whom. Given that you will most likely decide to purchase a toothbrush for the whole family, its cost is justified. The sleek, black case and the cover for the battery charger – a great addition to your toothbrush. Most models of electric toothbrushes are delivered without these accessories, but they are very useful if you travel a lot and do not want to part with such a long time a very useful gadget. On all rechargeable electric toothbrushes, the Oral-B manufacturer gives a money back guarantee. After purchase, you have 60 days to try the Oral-B Black 7000 in action. If you don’t like something, then you can return it to the manufacturer, who will return you the full price, no questions asked. Simply return your product along with your name, address, contact phone number, and the original cash register receipt indicating purchase price and date to the Oral-B. Also, all products covered by a limited warranty for two years in case if your toothbrush fails. If you’re wondering what users are saying about the Oral-B Black 7000, the following figures are much more eloquent than any words of praise: Currently, Oral-B Black 7000 has a 4.4 out of 5 stars on the Amazon online store and sold more than 2900 times. Toothbrush Oral-B Black 7000 is perfect for those who want to have a reliable electric toothbrush, which can be easily customized to your needs. Change the head and the cleaning mode, and you get a completely different toothbrush. In this regard, Oral-B Black 7000 – this is the perfect brush for multiple users. It is also a great option for the development of good habits – brushing your teeth properly. Quadrant timer and the brush timer will allow you to brush your teeth as long as necessary, and the pressure sensor will allow you not to overdo it and do not damage tooth enamel and gums. Oral-B Black 7000 – a good choice for people with arthritis or related diseases with limited joint mobility, because it does everything for you. At the same time, you get a clean mouth without much effort on their part. If your budget is tight, then you may want to look for something less expensive. The fact that the toothbrush Oral-B Black 7000 is the expensive model and the replacement of all heads will fly you a pretty penny. But sometimes there is a crazy deal on the Amazon (check the current price) and you can have the Oral-B Black 7000 electric toothbrush for the price of under 150$. You may approach one of the low-end models of toothbrushes Oral-B. For example, toothbrush Oral-B ProfessionalCare 1000 has a cleaning mode quadrant timer and pressure sensor but is much less expensive than the Oral-B Black 7000. According to the User’s Manual, full battery charge required 24 hours, for two minutes use, the brush needed to keep at the charging station for about 40 minutes. But this problem can be easily solved if you put the brush on the charging for the time when you are not using it. 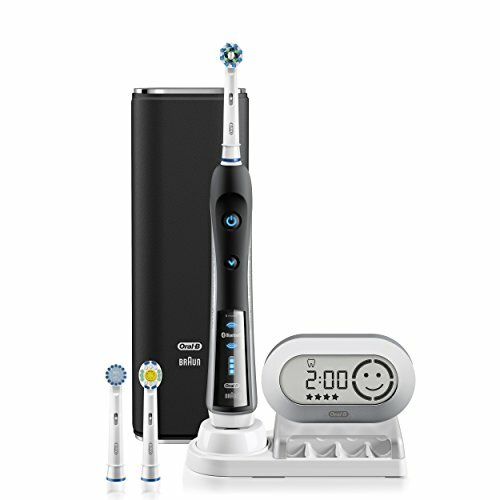 The brush provides a charge status display, so you likely will know whether you have enough power to use the Oral-B 7000. To get the most out of the Oral-B Black 7000, you should use it correctly. This means that when brushing your teeth, you need to make sure that within the specified two minutes, you have time to cover the entire surface of the teeth in your mouth. There is no need to brush your teeth vigorously, simply touch the surface of each tooth and you are good. Toothbrush head usually needs to be replaced every three months of continuous use. So, your brush will provide you the best quality oral cleaning. The heads of toothbrushes Oral-B are supplied with blue bristles that fade within 3 months. These bristles are a kind of reminder that it is time to change the head. A revolutionary new way to take care of your oral health, the 7000 SmartSeries with Bluetooth 4.0 connectivity not only removes more plaque but also eliminates doubt. Simply download the Oral-B app on your smartphone and connect with Bluetooth to get real-time feedback on your brushing habits. It’s the one power brush that actually communicates while it cleans, so you won’t wonder if you’re getting a superior clean— you’ll know. More InfoProduct prices and availability are accurate as of the date/time indicated and are subject to change. Any price and availability information displayed on Amazon.com at the time of purchase will apply to the purchase of this product. The electric toothbrush is more expensive than a conventional manual toothbrush, but it will make your teeth pearly white. A Proper electric toothbrush that is right for you depends on your budget and personal preference, but the best value for the money is the Oral-B Black 7000.